Sound (8.6/10) – Originally known as the Ultimate Ears Super.Fi 5, the single-armature UE 600 took its spot in the UE lineup over from the dual-armature Super.Fi 5 Pro model. Sonically, it differs greatly from its predecessor, taking on a more balanced and accurate sound. At the low end, the UE 600 sounds like a typical single-armature earphone, lacking the enhanced bass of UE’s dynamic-driver models. The bass is very level and controlled, with impact that is on-par with the Etymotic Research HF5 and lags slightly behind the MEElec A161P. The midrange, on the other hand, is more prominent. The UE 600 places the mids front and center. It is still more neutral than the vast majority of entry-level earphones but for me sounds slightly mid-centric, albeit very clear and refined. This could be due to an impedance interaction with my sources, but it is consistent across all of the ones I’ve tried. Tonally, the UE 600 is a touch warmer than the UE 700 and other TWFK-based sets, as well as the Etymotic HF5, but detail and overall transparency are still very good. The top end of the UE 600 is clean and smooth, if not particularly sparkly. The UE can’t quite match the delicacy and detail of the HiFiMan RE-400 but still impresses with the slightly relaxed nature of its treble. There is absolutely no grain and the earphone tends to avoid harshness and sibilance. It is also not overly critical of lower-bitrate files. I would say this was done on purpose due to its low price point, but the flagship UE 900 model has similar tendencies. Admittedly, the UE 900 does have better treble presence, energy, and extension, sounding more natural overall, but there is also a huge price gap in play there. The UE 600 possesses an impressively wide soundstage but doesn’t keep up too well with higher-end earphones. I found it lacking overall dynamics and the separation of higher-end sets such as the quad-driver UE 900 model. As a result, the soundstage has comparatively poor depth and layering and the overall sonic image is a bit flat, much like that of the similarly-priced Creative Aurvana In-Ear 3. Value (9.5/10) – The UE 600 is a little plasticky in build but remains lightweight, comfortable, and fairly well-isolating courtesy of the included Comply eartips. The sound is neutral to somewhat mid-centric, with very good clarity, decent bass presence, and smooth, forgiving treble. It sounds great with music and is especially well-suited for audiobooks and phone calls with its forward, highly intelligible vocal presentation. Simply put, it’s a great fit for anyone in search of a comfortable earphone with excellent mids. Hey, I was forwarded to your website by a friend and after researching the list and looking through my options I thought I settled on these headphones. Sadly, it looks like they went out of production in 2014? Last known pricing for the Logitech-branded variant in my country is from 2014 and even if I search in English I find them for a too steep for me $90 minimum. I will use them for music only. The only ‘genre’ I listen to is K-Pop. K-Pop of course consists of various genres, but my library excludes things like rap, hip-hop and R&B. I mostly listen up-beat music, but love my ballads when I’m in the mood for them. I consider the (female) voice to be the most beautiful instrument, in case it matters. I don’t intend to use my earphones much after my international trip, as I don’t normally travel much and use USB headphones at home. Hey Man!! How you doing?? Bad news.. My KC06 died (I bought them on your recommendation and they were the best iem I’ve ever had). Now I’m looking to buy a new quality budget earphone. I loved my KC06 because of the clarity (less bass as well), excellent mids and a fuller sound compared to my older cheap earphones. I’m torn between RE 400, Havi B3 Pro1 and UE 600. UE 600 is available at a very cheap price in my country i.e. around 45USD, so I’m inclined to get these. What do you say?? I really like highs in my music but can’t stand the harshness ( I hate my VSD1S and VSD3S for this reason). Do you think UE 600 has a similar sound signature as that of KC06 (non fatiguing highs, prominent mids and a fuller airy sound)?? Should i get RE 400 (probably dull sounding next to KC06) or Havi B3 pro 1 (I use Hidizs AP 100 without any external dac/amp)? The UE600 is not very durable but for $45 it’s a steal. Won’t be as bright or “exciting” as the KC06 thanks to its more smooth and neutral sound. It’s almost as “dull” as an RE-400, but a better deal at this price and very smooth. Probably wouldn’t bother with the Havi B3 unless you are placing more value on durability – it doesn’t really fit your target sound any better than the UE600. One more option – I often recommend the DUNU Titan 1 as a KC06 replacement for a similar type of bright (but not harsh), mid-forward sound, and someone recently mentioned that the Fiio EX1 is actually a cheaper version of that. I can’t confirm that myself, but it seems like a potentially viable $70 alternative. The Titan 1 itself is usually $100+. One more thing if you don’t me asking, does RE-400 and UE-600 sound alike? RE-400 is available at almost twice the price of UE-600 here (India). Don’t think it’d be wise to go for RE-400 for a slight bump in quality (If there’s any). I’ve heard Havi has a pretty wide soundstage and instrument separation (which i really liked in KC06) as compared to even RE-400. You think there’s any remarkable difference soundstage wise between UE-600 and Havi B3 Pro1. Havi is pretty inexpensive too (50 USD) if that matters. They are tuned similarly, yes. The RE-400 has some small advantages here and there but soundstaging definitely isn’t one of them – it’s just not a strong point of the HiFiMan. The UE600 has always been a good value, aside from durability which isn’t great. The Havi has a good soundstage, probably better than the UE600, but the sound signature you are describing matches the UE600 better. Thanks a ton.. Ordering ue 600 now..
Hope the UE600 turns out to be what you’re expecting! Hey! Maybe you can answer, how are ue600 compared to Brainwavz M5? Are ue600 good for metalcore or any -core genre? They are very different. The UE600 has a much flatter/more balanced response and is a much better reference earphone than the M5, which is warm and bassy, and a little deficient in treble. I don’t listen to much metalcore but if you want to hear it closer to the original recording the UE600 is a better earphone. It’s also the one I prefer. However, if you want enhanced bass and/or warm sound and don’t mind giving up some clarity and overall balance to get it, the M5 may well be a better choice for you. i find M5 bass is little more than enough, so i think ue will do just fine with it. will ue 600 handle high speed of metalcore, won’t they mess up instruments? The UE600 uses BA drivers that are quite quick and resolving. Maybe not as much as a pricier set like the UE700, but under $100 it’s very good. Thank you so much for your input on Headphones. I am really impressed what you’ve been doing for everyone. I have a question for you. I need to buy new earphone for me. I’ve been narrowing down to UE 600 and SE 215. I listen Jazz, classic, and potcast most of time. I’ve been using UE 500, UE 600, and Westone 1. Westone 1, surprisingly, it was too balanced for me after UE 600. It almost too flat for me, and my ear was hurting if I wear too long. Which one would you recommend? Also, if you don’t think either one is suitable for me, what other earphones can you recommend for me? Pretty different earphones but whileb the Westone 1 was too balanced coming from the UE600, the SE215 may be too bassy and rolled-off in the treble. It can be pretty tough to switch from an accurate signature back to a more consumer-oriented one. If you liked the UE600 you may also want to consider the HiFiMan RE-400 – they have quite a few similarities. thank you so much for such a fast reply! 🙂 I am sorry to ask you such a basic question, but what is the difference between accurate signature and consumer oriented? I looked up HiFiMan Re-400 review that you wrote, I think I am going to try HiFiMan Re-400 rather than buying UE 600 again. In a nutshell, a consumer-oriented signature simply implies a moderate to strong bass emphasis – i.e. what your average headphone buyer (think Beats by Dre demographic) expects when spending money on an aftermarket headphone. Thank you Joker! I order HiFiMan Re-400, and it will ship it by Tuesday. I can’t wait to try it 🙂 Also, Thank you for such a helpful posting, and reply. Hey man thx for the review. Razer hammerhead or logitech ue600 which one should i buy ? I dont have an idea about hammerheads clarity of the sound. Great review !! Could you comment on how creative aurvana in ear 2 and the audio technica ckx9 sonic will compare to the UE 600 in terms of sound,build quality. Can’t comment on those as I haven’t tried them but I can say that based on the build of my CKX5 the CKX9 should be superior to the UE600 in build quality. Would you be able to comment on how the ue600 compares to the Ety HF5? and the Klipsch x10? Most importantly how the highs roll off btween between the ue600 and x10-Is x10 more rolled off in highs? And how the bass between Ue600 and HF5 are-I worry that the HF5 is too bass light. The X10 is definitely bassier and more rolled off. It can’t compete with the balance of the UE600. The HF5 is slightly more balanced/less mid-centric. I prefer the bass of the HF5 to that of the UE600, actually – with a good seal it’s still pretty punchy and even though the HF5 is less warm, overall its bass is more linear and resolving. Thanks for your reply Joker! I guess right now I’m trying to decide on the HF5-sounds like it would be unique to any other set I have. However I also started eyeing the Yamaha EPH, and the JVC FXT 90 which both get excellent reviews from you and of course are more bass heavy sets. Decisions decisions! I got these for €40, but unfortunately they died. Thus last week I bought the Apple IDDIEM and to my surprise they are cheapest dual armature earphones on the market right now. I got them for €30, what a bargain, right? So what do you think of sound quality of the ADDIEMS? Oh, and which one is better? Yeah, of course they don’t deliver bass, since it’s an armature, which aren’t supposed to deliver bass, so yeah. But for €30 I got a pair of dual armature earphones :). i have a question. is this the same product with the ultimate ears super.fi 5vi? Yes, this is the Ultimate Ears version of the Super.Fi 5vi. There are some minor differences in the design and accessories but no major sound differences as far as I know. Hi – love the website, I’m new to all this and just getting to experince the differences between iems. I bought the UE600vi after reading this review. I really want to love them but they’re just, for me, lacking enough bass. I dont want a basshead iem but do want it to be full when required and a lot of the time I’m straining to hear a bassline. The other iem I have tried is the Soundmagic E10 which does have a lot more bass as I would like, it makes the sound exciting, but it tends to overwhelm things a bit too much and not have enough sparkle. I kind of want something inbetween, more of the bass impact and presence of the E10 with the clarity of the UE600 and an added sprinkle of sparkle, which annoyingly I get more with my standard apple earbuds. Any suggestions would be gratefully appreciated! apologies for probable misuse of terms. Glad the website has been useful! Depending on budget, I would look into one of the VSonic offerings for what you want. They typically have mild bass enhancement, an emphasis on clarity, and pretty good treble sparkle. If the $99 GR07 Classic is in your budget, that would be a good one as it has more controlled bass compared to lower-end VSonics: https://theheadphonelist.com/brief-impressions-vsonic-gr07-classic-plus-warning/ . Another option at this performance tier is the Philips Fidelio S1, which I’ve seen as low as ~$85. If you;’re aiming for $60 or below, the VSD3S is extremely good at about $50: https://theheadphonelist.com/brief-impressions-vsonic-vsd3s-ostry-kc06-havi-b3-pro/ . There’s a lot of other sets that fit the mold of bass quantity between UE600 and Soundmagic E10 + good treble sparkle + an emphasis on clarity – the LG Quadbeat F420, for instance, does that and is much better than you may expect for the price. The Astrotec AM-800, too. The link for 600vi is wrong. Hi Joker, Tried the RE-400 today and I’m loving it! Thanks so much for your suggestion and keep up the excellent works! I’ve been referring to your articles since two years and since then I kinda had my eye on these UE 600. I just wanted to know if you’d promote this one instead of other similarly priced IEM in your list. Am a student and hence on a budget. And am asking because I haven’t seen you recommend these anywhere else. Please let me know soon. And keep up the awesome work man. Really appreciate your efforts. I have thought about the Astrotec AM-800. and Xiaomi Piston 2. I am new so I do not understand about the v shape songs and bass songs but I am looking to learn and not just by reading but by actually listening so I’d say I want a learner’s earphone lol. The reason these aren’t included in my main buyer’s guide is that UE doesn’t make them anymore. Between the three you are considering the UE600 is by far the most neutral and accurate. The AM-800 is brighter and not as rich and pleasant in the midrange while the Piston 2 is warmer and bassier, with more bass bloat and poorer clarity. If you want to learn by listening I would recommend trying a few sets across different sound signatures – no necessarily expensive ones – and listening for the variations between them. The UE600 is definitely a great start for balanced/slightly midrange-focused sound. I know the path of a learner is a bumpy one with most bumps being price vs performance. I plan to go for the ue 600 but now am thinking I should look for something to compare its marvel with. the UE being more accurate i was thinking the piston would be good for comparing it since its more v shaped. or the brainwaves M5 as an intermediate iem. And most of all, thanks for the prompt response. Thanks a lot 😀 really. I would get the Piston2 or the Brainwavz S1 over the M5. How is this UE600vi compare to Apple In-Ear headphones? My Apple in-ears broke a couple of years back so I haven’t heard them in a long time. From memory, the UE600 is not hugely different but has a more full-bodied and natural sound, especially in the midrange, and also smoother treble while maintaining excellent clarity. Shouldn’t have any problems with the eartips falling off with the UE600, either. The UE600 and MA750 sound very different – despite the similar SQ rating they are not strictly comparable. The UE600 is more of a reference signature and is a lot more flat/accurate/neutral than the MA750. The MA750 has tons more bass, less presence in the midrange, and an overall more colored and consumer-oriented sound. It’s really important to decide which sound you want before picking one. I see, thanks a lot for that. So could you please suggest me which IEM under $150? I listen any kind of music but mostly indie pop. Not necessary with microphone as I think I better switch to Apple’s earphone for calls. Sorry, I narrow my choice. What do you think about the UE 600 compare to HiFiMan RE-400 Waterline? They’re both well-performing earphones. If you can afford the RE-400 and don’t need the extra features (mic, etc) of the UE600, I’d go for the HiFiMan – it has slightly better bass weight and body and more balanced mids, sounding more natural as a result. Hey Joker! I’m looking for ~$50 IEMs and I stumbled across your website. I’m torn right now between the SteelSeries Flux, The UE 600s, and the MEelectronics A151. I’m not a fan of this generation of UEs as far as build quality goes. With this plug that simply lacks strain relief there’s just not much you can do other than being careful with the cable when you use them (and when you aren’t using them), and also keeping the receipt for warranty. That said, the UE is by far the most popular of these three, and probably the one with the most “consumer” owners (i.e. teenagers and such) so it’s likely at a disadvantage to the other two as far as customer feedback goes. Get some Sugru (moldable rubber that air-cures) and mold it around the junction of the jack and cord. My UE600vi’s are still going strong after a year of working out with them, and I don’t think the sound can be beat for the current price of $55. I was looking for this in my country but what i came across the UE700 instead (which is currently on sale because the seller is closing shop). The UE700 looked comfortable enough to be used for an extended length of time as well as for sleeping. I was wondering if u can give me some impression about it. 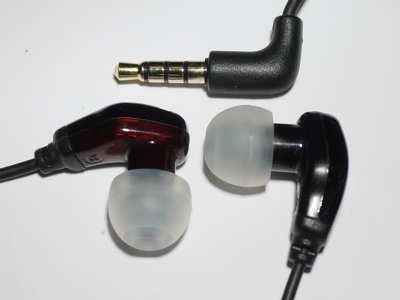 Yeah, the UE700 is a TWFK-based earphone and is quite a bit brighter than the UE600. There are actually two versions of the UE700 – the pre-Logitech version and the newer Logitech version – which have a slightly different design and sound slightly different. I preferred the newer version, which has the L-shaped plug – it seemed more balanced, almost like a Brianwavz B2, whereas the older one has occasionally bothersome sibilance. Bass is flat on both (like most other TWFKs) and clarity is excellent (ditto). Comfort is also suberb. Build quality is similar to the other cheaper UE products – UE500, UE600, etc – generally passable. Thanks joker 🙂 i’m pushing through with the deal. I’ll leave an impression here when i get the chance. It seemed to have this 2 stage silicone tip insertion design. The 1st stage allows us to have a some what loose tip insertion and gives the IEM a more transparent presentation of the music but lessening the weight of the already not so deep mid bass impact. The 2nd stage allows for a more secure tip insertion, a deeper seal in the ear, and adds more definition and weight to the mid bass but lessens the transparency on the sound. I would say the sound signature on the UE700 is flat and transparent. The sub bass extension is sooooo unsatisfyingly weak for me. The weight on its’ sub bass is almost at the verge of non existence and is only fixable when using foam tips. The mid bass is more detailed than cheaper IEMs but still lacks presence (this must be due to the weak extension on the sub bass). The mids are clean and neutral on songs but was thinny when used for phone conversations. The mid highs are again more detailed than cheaper IEMs but still lacks presence in my opinion. The highs are sparkly but not to a point of causing hearing fatigue unless the volume is set on high. The soundstage is more on the narrow side with just enough spacing to give the music depth for separation, also having two BA drivers in it makes for great transparency effect on the sound. On comfort, it is very light weight, comfortable, and can achieve a deep insertion in the ear but sleeping with this IEMs on is still a mixed bag. It still sticks out of the ears quite a bit and the imagination of accidentally scratching the chrome finished housing is scary. I was also looking at pictures of UE IEMs online and I’ve noticed that they’re pretty consistent with this strain relief-less design. It’s a bit scary since their IEMs aren’t really cheap (price-wise) to start with. The lack of left or right indicator bump is also very annoying. That said, i don’t think the UE700 is worth its’ price in terms of sound quality and construction. Its’ something that i would recommend only if its’ on sale. I do see a potential though for people who wants a flat sound signature, transparent music presentation, and wouldn’t mind (or perhaps intensionally) using EQ.